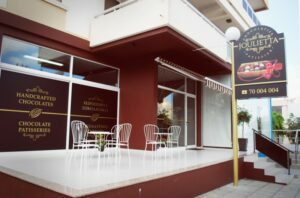 Step into Joulietta’s Chocolate Shop in Paphos and experience a chocolate lover’s dream. Enjoy the ambience and delightful aromas as you browse the wonderful selection of handcrafted, luxury chocolates made on the premises every day by Joulietta. Joulietta became aware of a resurgence of interest in luxury artisan chocolates. As she has always been a chocolate lover herself, she decided to indulge her passion and educate herself in the fine art of chocolate making. 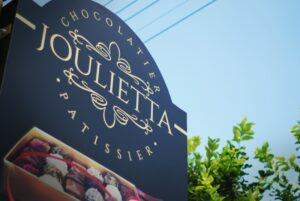 After enrolling in a number of courses arranged by Barry Callebaut, the world renowned Belgian chocolate manufacturer, Joulietta graduated with honors, ready to establish her own business in Paphos. She had the idea of combining techniques and methods learned from the master chocolatiers at Callebaut with natural flavours and ingredients of Cyprus. 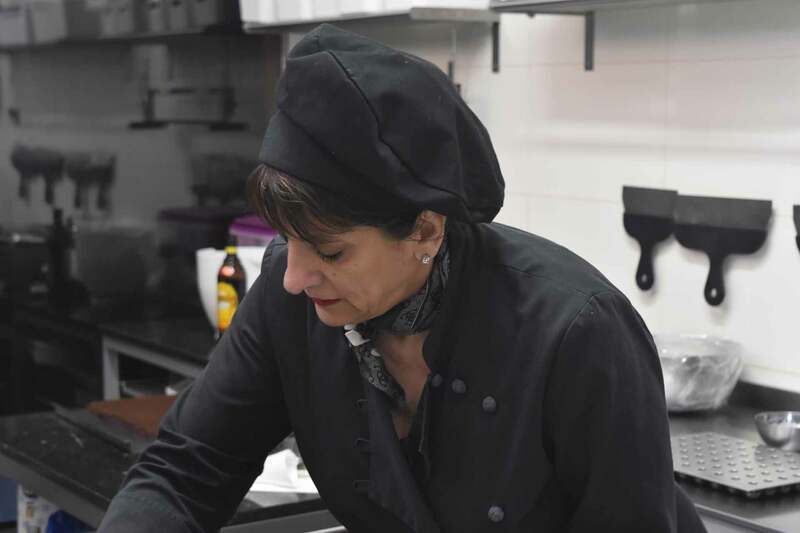 Her signature chocolate which made a huge impression on her tutors during the training course is Cyprus Double Delight. A rosewater or bergamot delight is combined with a ganache covered in dark or milk chocolate creating an amazing chocolate taste experience. Since then she has developed a range she has named “Cyprus Garden” which includes such delectable creations as Basil & Orange, Fresh Mint & Honey, Wild Thyme & Lemon, Lavender & Honey, and Rose. 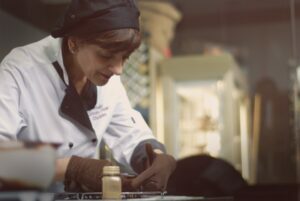 Although her focus is creating new and exciting chocolate flavours, she has also started developing a luxury range of patisseries with a chocolate theme. If you like cheesecake, her Baked Lemon Cheesecake with White Chocolate will take your taste buds to new heights. For serious chocolate cake lovers, her Sachertorte has to be tasted to be believed. With the finest ingredients including a 68% dark Costa Rican chocolate, a slice of this cake accompanied by a cafetiere of coffee makes for a wonderful “treat yourself” experience. Brownies made with real Belgian chocolate, and irresistible chocolate tarts have recently been added to the range. With Joulietta’s bubbly, friendly, outgoing personality, every visitor is treated as a valuable guest. Why not pop in and meet Joulietta yourself. She is always happy to provide a taster of her latest creation. “My father ran a restaurant called Mr. Strone’s in Manchester for many years. It was a favourite with many of the staff and actors from the Granada TV studios just round the corner. Although my father retired from the restaurant business some years ago, he has not lost his passion and expertise when it comes to good food. He loves preparing tasty, mouth-watering Cypriot dishes. In fact, we both share a passion for good food and take great care in sourcing quality ingredients. I am sure this background moved me to qualify as a chocolatier. I first took a course at Slattery in the UK, followed by an extensive course at Ecole Chocolat where I graduated with honors. Welcome you lovers of luxury artisan chocolates! This beautiful and diverse island provides an abundance of delicious herbs, citrus flavours and liquers that go to making some of the most divine chocolates you will ever taste. Your mouth will water !